Fred Panopio, who popularized yodeling in the 1970s, has passed away due to cardiac arrest. He was 71. Fred Panopio, the singer who popularized yodeling back in the 1970s, has passed away. He was 71. Cardiac arrest was the reason behind the death, said his niece Joy Esguerra Panopio in an interview with GMA News. Her uncle died past 3 p.m. yesterday, April 22, she added. Panopio's brand of music became a hit, like "Pitong Gatang," "Markado," and "Tatlong Baraha." His song "Kawawang Cowboy" also became a well-remembered song. Back in 1999, he and fellow musician Victor Wood released an album together called Certified Jukebox Kings. He was active in the entertainment scene until 2004 with an album compilation called Pitong Gatang. 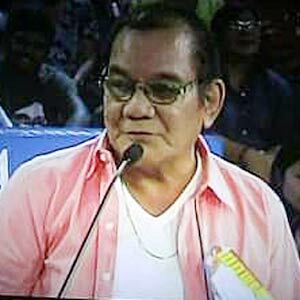 Besides being a musician, Fred Panopio appeared in numerous films from the '60s to the '90s, sometimes starring alongside movie greats such as Fernando Poe Jr. and Jess Lapid Sr. The singer's remains now lie in state at Greenpark in Pasig City.